Welcome to PCCCS186 with the Paper Craft Crew; this week we’re keeping it interesting with a Tic-Tac-Toe challenge! The hard part for me was keeping it down to one line; I knew I wanted to make a birthday card, as it’s my niece’s birthday on the 19th, so I did add that in, but stayed with the middle line across – Sequins, Feminine and Die Cut or Punch. 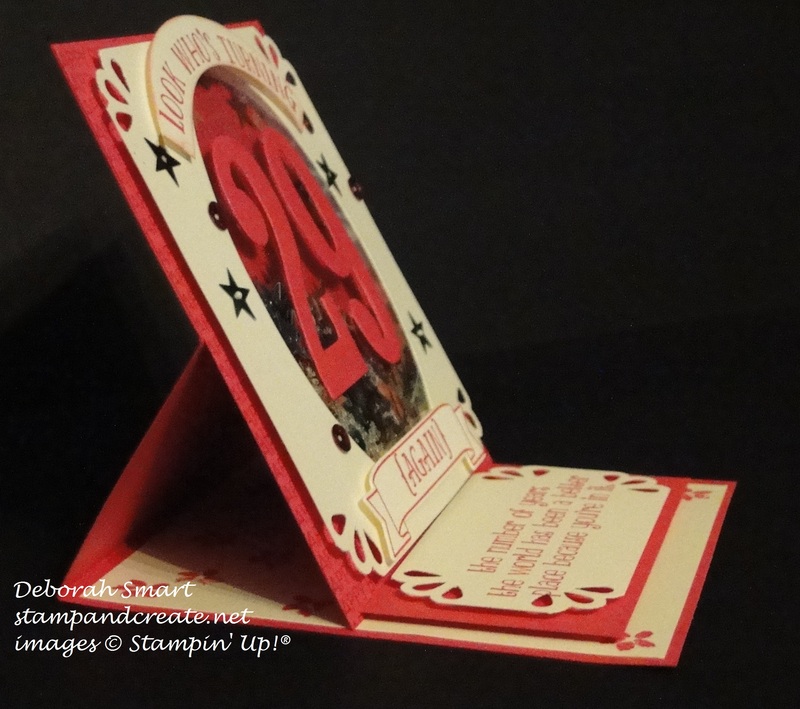 Since it’s a birthday card, I decided to add a little fun with the die cut, and make it a shaker card – and an easel card! I started out with a panel of Very Vanilla cardstock, and die cut the centre using the Ovals Framelits. Then I used the Curvy Corner Trio punch on each corner for the lovely scallop. I used a Paper Pumpkin stamp to repeatedly stamp ‘Happy Birthday’ across the panel of Melon Mambo cardstock, in Melon Mambo ink. I used the next largest Oval to die cut another oval from a Window Sheet, and attached that to the back of the Very Vanilla piece, to cover the opening. Then I attached some strips of double-sided tape (like dimensionals, except in strips) that I had left over from a shaker card kit at Christmas, around the oval. I filled it with sequins, then layered the ‘Happy Birthday’ stamped panel over the back, covering the sequins so that they stayed inside the window sheet. I die cut the numbers from Melon Mambo cardstock using the Large Numbers Framelits Dies (which I of course purchased as a Bundle with the Number of Years stamp set, saving myself 15%! ), and attached the numbers to the window sheet using Glue Dots. 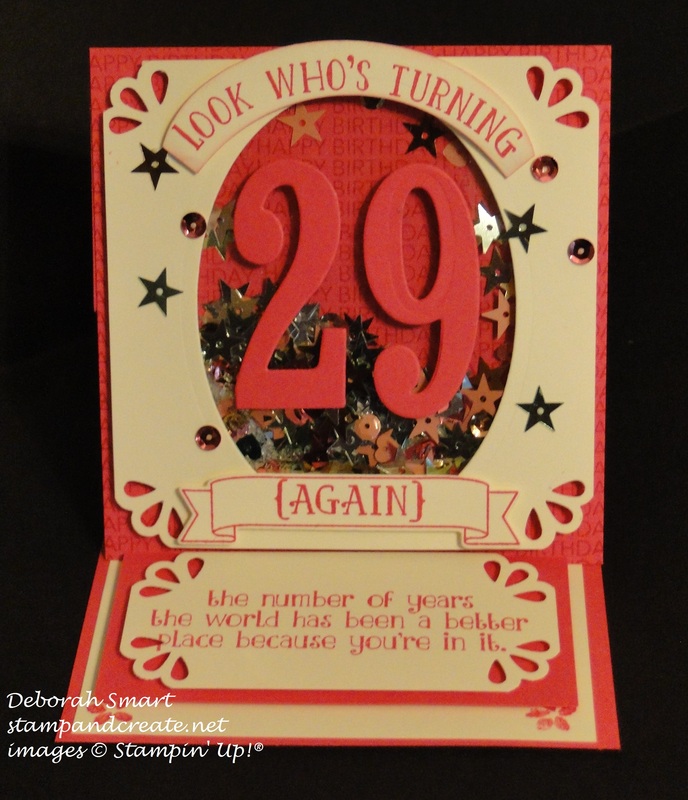 Next, I stamped the sentiments from the Number of Years set onto Very Vanilla cardstock in Melon Mambo ink. The ‘look who’s turning’ I cut using 2 Ovals Framelits; the ‘Again’ was die cut using the banner that comes with the Large Numbers Framelits, and I again used the Curvy Corner Trio Punch on the 4 corners of the larger sentiment. You can see that I also stamped some flowers onto the inside panel, and glued some more sequins onto the card front. I hope that my niece will enjoy her card, and I hope you’ve enjoyed seeing it, too! I also hope that you’ll check out the fabulous cards that the rest of the design team have made; you can see them on the Paper Craft Crew page. Then, decide which Tic-Tac-Toe line you’d like to tackle, and link up your card for the challenge! I’m looking forward to seeing your card! Until next time – happy stamping! Next Next post: Wacky Watercooler March Madness Blog Hop! Deb, wonderful card. Really “complex”, attractive and well done! I admit to going a bit ‘extra’ on this card, Jackie, since it was for my niece 🙂 Thanks for your lovely comment!